- steel/frame material sl/SLX or something else? - colour green yellow and red, accidentially? The rear brake attacment is straight not pointed as many of the EM-bikes. But i guess its a 95/96 Columbus SL. The "group" is a bit younger than the frame, dura ace + Chorus brakes and stem bearings, cinelli bar, itm quill stem and elite cage. The wheels are wh-6500 - ultegra - kind of cool. I can't really make out the numbers on your BB pic but this link will help you out there. Similar colour scheme from this 1994 catalogue page. The rear brake "housing" on the Seat stay is pointed on the Corsa in the ad, and the colour scheme is on a TSX. I havnet found any corsa with the same colour scheme, and no confirmation that this is a SL frame. I have seen that colour before on a cyclocross frame, I am sure I have the link somewhere so will try and find it. It might help date it as I can't really make out the numbers on this computer. I have a feeling its late 80's from memory. It does look like a straight Corsa, most likely SL, could be TSX but it should say so somewhere, as with SLX being a Corsa Extra. Will delve into my stuff and get back to you. I've seen it on a couple of bikes on eBay: a Corsa Extra and a MX-Leader. I think it's a reasonably standard paint-job. 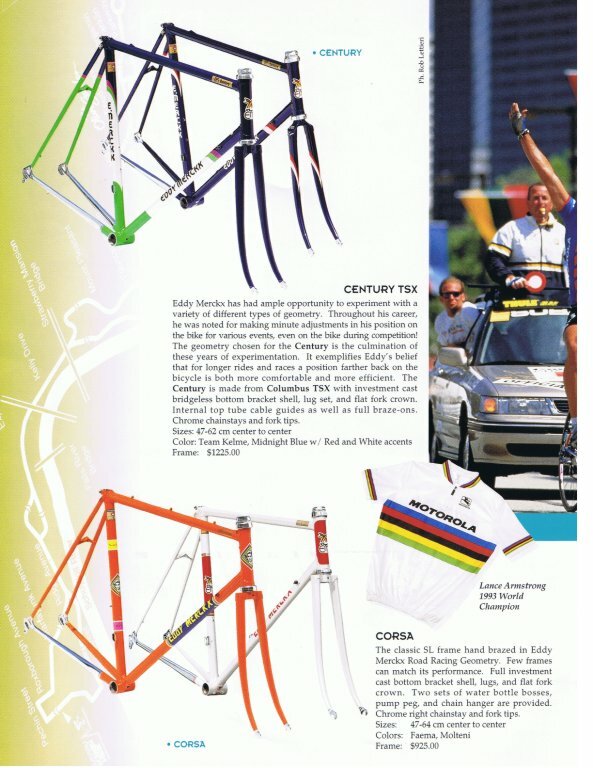 I have a purple Merckx Corsa Extra, which I hadn't seen the paint on anything else until recently when I spotted a Strada-OS and an Arcobaleno on eBay with the same scheme. There are quite a few paint schemes but not an infinite number and Merckx made a fair few bikes over the years so you're bound to see one sooner or later, even if it's just on line! A standard Corsa is SL and a Corsa Extra is SLX, hence the X. The paint scheme is a standard scheme that came in many variations over the years. Its a great machine, ride and enjoy. Eddy Merckx Professional 1983, re-paint ( factory ? ).